Stripes and stars give the wear-all-year shirt a spring update. We never thought we’d be looking to men for outfit advice, but they’re definitely on to something with their go-to classic button-downs. Think about it – from work to weddings, men wear cotton shirts all year round. Lightweight enough to wear when its warm but providing enough coverage on cooler days, it’s no wonder they’re a fashion pack staple this season. Blue and white banker style stripes are the street styler’s current obsession, and on-trend star embroidery adds extra oomph to ours. Unbutton the collar and roll back the sleeves when the sun comes out. 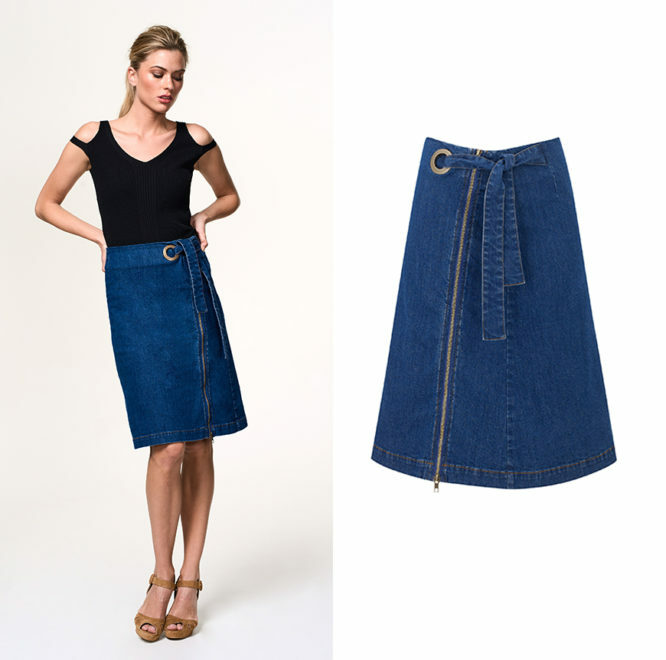 Seriously versatile, you’ll wear our denim skirt with everything. There’s nothing worse than wet jeans (ok, obviously there is but you know what we mean) which is why a skirt is the best way to work denim when you don’t know what the weather’s doing. It won’t cling to your calves and thighs like a clammy second skin when you get caught in a downpour, and it looks as good with a fine knit and ankle boots as it does a summery top and sandals. Or trainers. Or heels for that matter. Oh, and shirts and t-shirts too. Brighten up any look with our cobalt cropped trousers. Desperate to work a summer look but the weather just won’t play ball? We hear you, and there’s only one thing for it – you’ve got to bring out the brights. Popping colours instantly lift any look – case in point Lucy Mecklenburgh’s leather biker, white tee and cobalt culottes combo. Smart enough to wear to the office and cool enough for off-duty, wear our cobalt cropped trousers with muted shades on grey days, then go to town with clashing colours if it ever warms up. 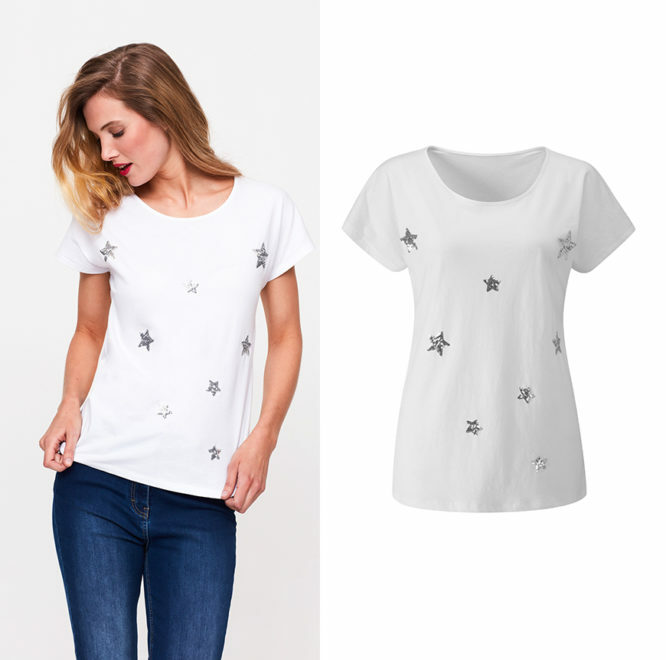 Silver sequin stars give the classic white tee a luxe upgrade. If there’s one item you can wear whatever the weather, it’s a classic t-shirt, and nothing says spring like crisp white cotton. Silver sequin stars give the go-with-everything white tee a luxe new season upgrade, making it the perfect piece to wear with casual denim or smart skirts. 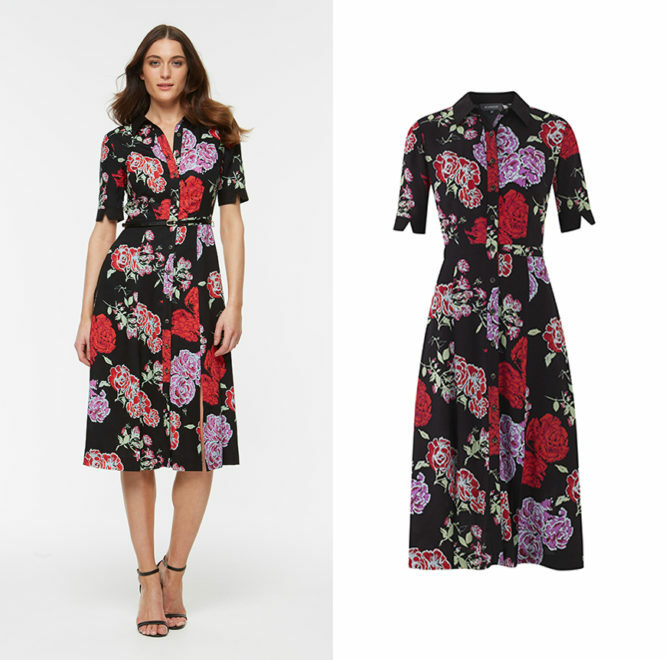 Bright florals and a dark base colour make for a dress that works rain or shine. There’s no denying sunshine and florals go together like fish and chips, but they can seem a little incongruous when it’s and tipping it down outside. The solution? Spring blooms splashed on a black background. The darker base colour of our shirtdress means the bright petal print won’t look ridiculous when it’s gloomy, while the lightweight fabric and front splits make it cool enough for hotter days. Add a leather biker and ankle boots when you need to beat the chill or wear it solo with your favourite heels or sandals.